IMAGINATION! #12 38 Sep 3 SCIENCE FICTION EYE Julius Schwartz Science Fiction Mystery: The late Garrett P. Servlss will be long remembered as the author of such superb science fiction novels as "The Second Deluge", "The Columbus of Space" & "The Moon Metal". Yet none of these storys has received as much publicity as his The Conquest of Mars. Ever since a reader mentioned this story in Argonotes several yrs ago many fans have tried to locate it. As far as I know all such efforts have failed. A thoro search revealed no story of Serviss bearing that title was Published in any magazine or bk from 1890 thru 1930. For a time I suspected this story was but a figment in the imagination of that Argosy reader. Finally someone had the wise thought of contacting Serviss' widow in Paris. She revealed she too had been trying for yrs to secure a copy of this story--without success. She seemed to recall tho that the novel appeared serially in the New York JOURNAL about 1898 & may have been syndicated to other papers. & now for the amazing climax to this mystery: An inquiry to the JOURNAL revealed their file for 1898, along with several yrs, was destroyed by fire! & to date they have been unable to fill in the gap. Weinbaum Still "Lives": With the printing of "Revolution of 1950" (formerly "The Dictator's Sister"! & "Tidal Moon" every word of science fiction written by the late Stanley Grauman Weinbaum has been published with the exception of his 2 novels, "The Black Flame" & "New Adam". The former is almost certain to be the lead novel in the initial issue of the new Standard science fiction magazine. Ray Palmer is trying to persuade Publisher Davis to print "New Adam" serially in Amazing Stories. "Tidal Moon" to appear in the December Thrilling Wonder, was written by Helen Weinbaum from the plot & first 447 words by brother Stanley. Science Fiction Round-Up: Watch for a new game — "Movie Millions" — to be put out by one the country's leading novelty manufacturers at the end the yr. It was invented by Mort Weisinger, who's so confident it's going to make 1000s of $s that he's bought a I938 Buick on the "royalties". Inspired by Howard Hughes' round-the-world flight, Eando Binder has written a story of a flight around the Solar System -- probably to appear in Thrilling Wonder. A. MERRITT spent 4 yrs trying to obtain a first edition copy of his famous book "The Moon Pool." 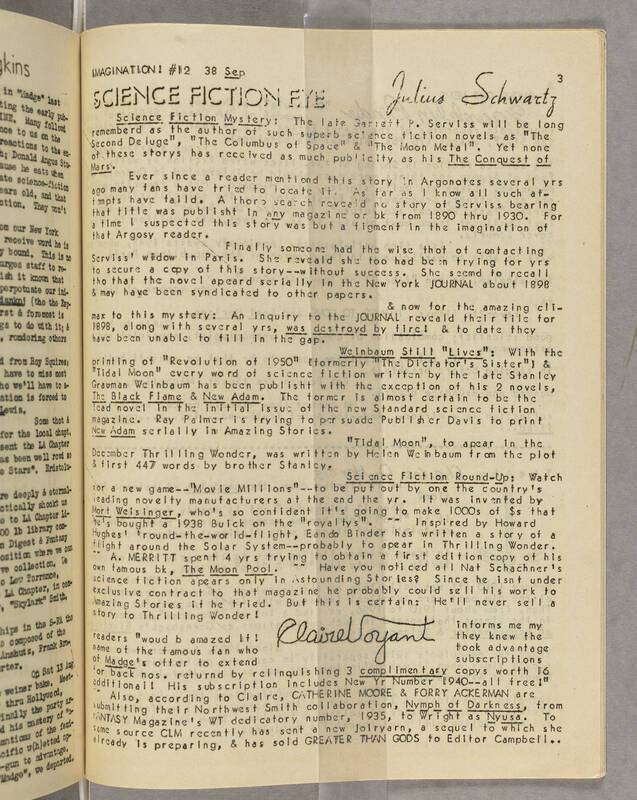 Have you noticed all Nat Schachner's science fiction appears only in Astounding Stories? Since he isn't under exclusive contract to that magazine he probably couId sell his work to Amazlng Stories if he tried. But this is certain: He'll never sell a story to Thrilling Wonder! Claire Voyant informs me my readers "would be amazed if they knew the name of the famous fan who took advantage of Madge's offer to extend subscriptions for back nos. returned by relinquishing 3 complimentary copies worth 16 additional! His subscription includes New Yr Number 1940--all free!" Also, according to Claire, CATHERINE MOORE & FORRY ACKERMAN are submitting their Northwest Smith collaboration, Nymph of Darkness, from FANTASY Magazine's WT dedicatory number, 1935, to Wright as Nyusa. To same source CLM recently sent a new Joiryarn, a sequel to which she is already preparing, & has sold GREATER THAN GODS to Editor Campbell.